D.I.D Electrical is the foremost electrical retailer in Ireland, offering the latest technology and appliances at the lowest prices. D.I.D Electrical is 100% Irish owned, and guarantees the best in customer service, advice, support and the widest range of quality products at Ireland’s best prices. With 22 stores across the country, D.I.D has come a long way since opening its first store in 1968 on Mountjoy Square. How it Works: Use this gift voucher on AllGifts.ie to order gift cards for use in any D.I.D store in the Republic of Ireland. Or you can swap this voucher for any other gift or voucher listed on AllGifts.ie. D.I.D gift vouchers are posted out free of charge once ordered. 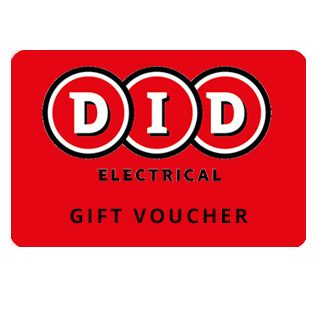 D.I.D Electrical store gift vouchers are available in denominations of €25, €50 and €100. Minimum gift card value is €25. D.I.D Electrical gift vouchers are posted out free of charge, normally within 5 working days.